From the hit wacky 1966 Batman TV Series! This Batman 1966 TV Series Batmobile Pop! Vinyl Vehicle features Batman's trusty super-vehicle rendered in the adorable Pop! Vinyl format. Plus, it even comes with a 3 3/4-inch tall Pop! Vinyl Figure version of Batman from the 1966 TV Series that fits perfectly inside of the Batmobile! Batman figure sits inside the Batmobile! Any 3.75" Pop! 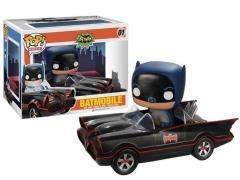 figure can sit in the Batmobile!